Need Wedding Decoration Ideas and Tips? Every bride has a picture in her mind of how she wants her wedding ceremony and reception room decorated. Whether it be a soft dreamy traditional decor or a chic modern look, it takes a little creativity and a well thought out plan. Your decoration ideas should flow from your ceremony to your reception. If you drastically change colors or themes it will make your wedding look disjointed and not well thought out. After you have chosen your colors and theme, think about your budget, family traditions and locale. If you are having your reception in a catering hall you may not need to invest too much time or money in decorating, as most catering halls are already festive and well decorated. If you are planning a house wedding you can place candles throughout the house, creating that ever so soft romantic atmosphere. Keep in mind an inexpensive wedding idea is to use streamers, round paper lanterns, wedding bells, or hearts and balloons that match your color scheme to accent archways, walkways and your rooms. Floral centerpieces add a touch of elegance to any table. If you are using fresh, dried or silk flowers you can place a scented candle in the center giving you that romantic look with a sweet fragrance of vanilla, pine, cinnamon, bayberry, or peach just to name a few. Keep my decor ideas in mind before you start planning your decorations for a church, synagogue or mosque. Check with the office to determine what, if any, decorations you will be permitted to bring. If you keep it simple, you shouldn’t have a problem. Candles come in many styles and colors, so shop around until you find the ones that add just the right pizzazz. 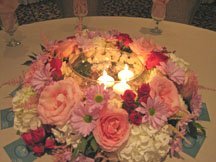 Your centerpiece should not detract from conversation, therefore, a low to the table or high on a pedestal centerpiece will work best. 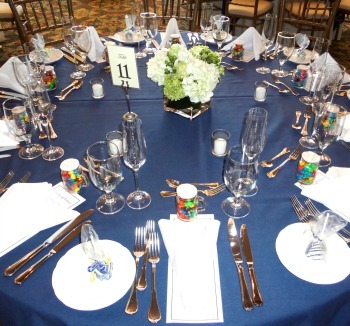 Decoration ideas are plentiful; try using your favor as an additional table decoration. Favors can be wrapped in paper using a color from your wedding palate. 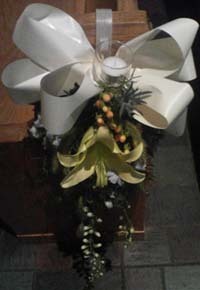 Once wrapped use ribbons, bows, baby’s breath, or pearls to give your favor a professional look. Remember to ask what the guests can use to honor you as you are leaving the ceremony. Typically you can have your guests blow bubbles, throw seeds, or confetti, flower petals but it is thought that rice will harm the birds, so throwing of rice is usually not permitted. A winter wonderland wedding theme can be created by decorating with snowflakes, confetti and crystals. Using snowflake place cards at the entrance table will set the tone of your winter bridal reception. You can also use Christmas decorations like poinsettia's, vases filled with tree ornaments or sleds with fake snow and flowers. People love pictures, so creating a collage of you and your hubby will delight your guests and add a personal touch to your bridal decor. Imagine how surprised your guests will be, if you display pictures of you and your guests. Now that's a time consuming project but will surely delight your friends and family. Everyone loves cake, so why not incorporate your cake into your Wedding Decoration Ideas? A tiered bridal cake is a beautiful decoration that adds style and romance to every reception.Notice how this bride decorated the cake table with fresh flowers, tea candles and large tiered candles in a glass holder. 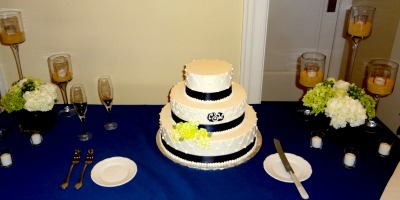 Be creative and ask the baker if you can have your wedding colors worked into the cake as rosettes or fresh fruit. A Champagne fountain will add style and class to your reception. If Champagne is not your thing, you can use punch or juice to create a really sophisticated wedding decoration. So you don’t want a flowing beverage, how about chocolate? 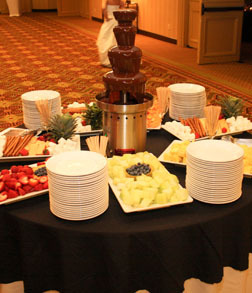 A cascading chocolate fountain will delight everyone who has a sweet tooth. 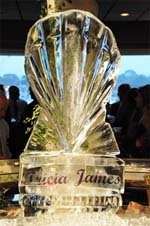 Ice sculptures that coordinate with your theme are a fancy decoration and having the bride and groom's name engraved as shown below is an elegant touch. Remember to take advantage of the sales that stores run at the end of each season. You can purchase silk flower arrangements, candles, ribbons, and bows all at a fraction of the original cost and store them away until you are ready to use them. Keep my wedding decoration ideas in mind and with a little imagination and planning you can create a decor that is memorable and will awe your guests.